I’m not a huge fan of bumper cases, but this particular one for iPhone 7 and iPhone 7 Plus has my attention after I saw it surviving a 500-foot drop test. At times, even a ‘decent’ iPhone case can fail miserably. Take a look at Apple’s official Leather Case for iPhone 7 and iPhone 7 Plus. It’s an expensive little accessory that protects your device, to some extent, but doesn’t really offer any sort of shield against drops towards the bottom edge of the phone. That’s where the case completely loses its priority as it is left open for no apparent reason. If you step things up a notch, you can opt for a thick bumper case for your iPhone too. Sure, they don’t protect the device from the back as a normal case would, but when it comes to drops, bumper cases can be fairly robust. Take a look at the RhinoShield CrashGuard for iPhone 7 and iPhone 7 Plus for instance. It looks like a fairly normal bumper case. Something that would protect your device from a small height of, let’s say, 3-feet. In fact, the official marketing material suggests one can expect protection from drops of up to 11-feet. That’s a lot of height if you’re asking us, considering the average human is only 5.6-feet for males and 5.2-feet for females. Here’s the part where it gets interesting. 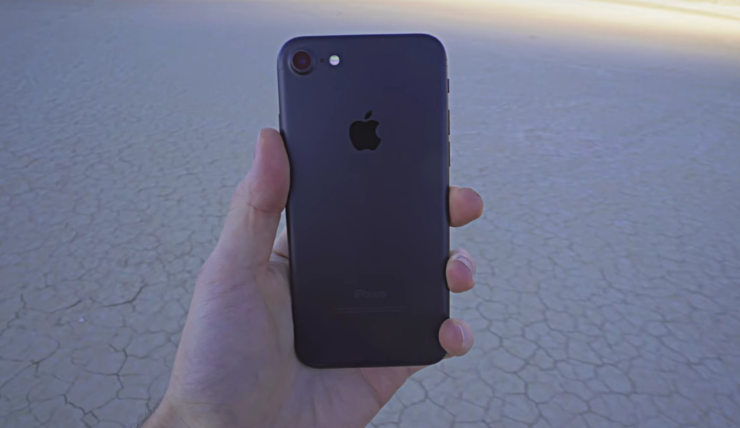 Jonathan Morrison from TLD decided to step things up a notch and tossed an iPhone 7 from a height of 500-feet from a helicopter. But that’s not all – he put on the CrashGuard bumper on the device to see how it fares. And the result? Check out the video below and you’ll be amazed. As you can see, the iPhone 7 survived and was still recording even after impact. Apart from RhinoShield itself, I would give massive props to Apple as well for creating such a durable phone. But wow really, that CrashGuard does live up to its name. And interestingly, it managed to save the device’s rear shell completely from any sort of damage too. This is something I wasn’t expecting at all. See, I’m not a huge fan of smartphone bumpers (up till now at least) but this one caught my attention to the point where I’m honestly considering to ditch my iPhone 7 Leather Case completely. Of course, there won’t come a point any time soon where I might drop my smartphone from a helicopter, but at least I can rest assured a bumper like the CrashGuard will keep me covered from other sort of drops. If you’re interested, you can pick up a RhinoShield CrashGuard for iPhone 7 or iPhone 7 Plus for just $24.99. Not bad, considering what it is offering outside of the marketing claims.